I have seriously wanted to sink my teeth into making a great keto pavlova for quite some time! The time was right this Christmas with my beautiful new Smeg oven. Not only do I love my recipe but man I love and appreciate my Smeg. It is funny that someone like me, who has been blogging for close to 6 years has only finally lashed out and got themselves a very much needed oven. When you realise that you are asking friends and recipe testers to photograph their baked goods for you to share that you definitely need a new oven. This is not the first time I attempted a keto pavlova. Last year with my very much dying Westinghouse oven I attempted this exact recipe and it failed miserably. It was not crisp, it was not high, and it certainly wasn’t edible. This keto pavlova though is perfection. Keto Pavlova – not so sweet! Even when you spoon the very thick and silky raw batter onto your tray you know this is going to work. The mix is stiff and glossy and delicious. You will note that I have not made this a very sweet mix at all. I think it is far better than any pavlova I have eaten before due to the lack of that sickly sweet white sugar flavour. Please note that Xylitol is NOT a suitable sweetener for the Pavlova. It tends to leave it soft and chewy. After the keto pavlova has finished cooking it is time to leave it in the oven and cool there completely. This reduces the chances of cracking your pavlova, and also gives it a great crispy crust. I even did a little video to show you how it can be re-crisped and you can audibly listed to the crispiness of the crust. 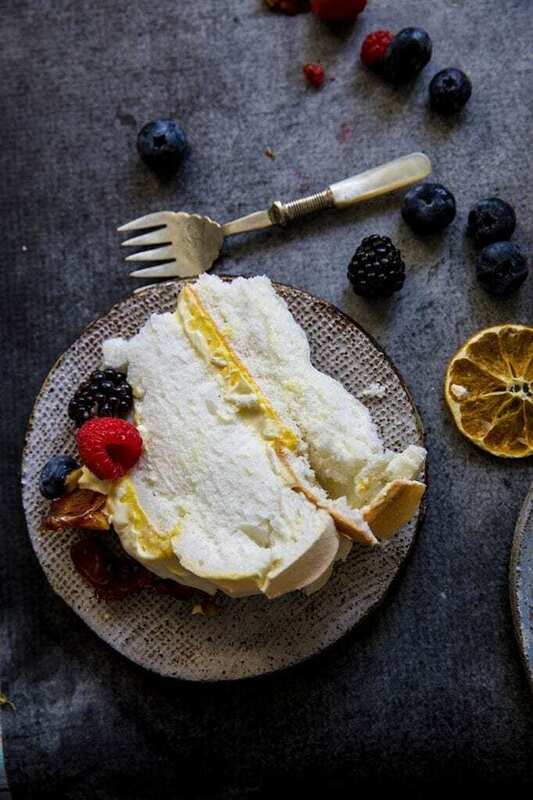 In the images you see of the decorated keto pavlova I have actually done two separate ones and stacked them with some of the lemon curd and double cream between. Topped with berries and my delicious soft Christmas Praline. The sweetener I have used is Sukrin Melis available only online. Basically it is a powdered erythritol so if you do want to just mill some erythritol that will work as well. Only $24AUD for a 42 fabulous recipe eBook! 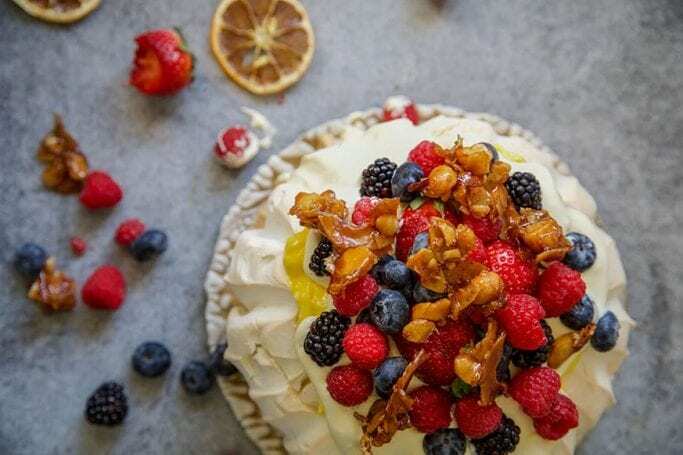 Want a Keto Pavlova Cooking Class? Growing up I was never a big fan of the pavlova although I always wanted to try one of those Pavlova Egg Magic’s. Remember them? I know they are still available but I am not quite sure how many people actually buy them. Still this day I havent and I guess I never will. My next test is for a Christmas Wreath and an egg free pavlova. Fingers crossed it turns out perfect. Anyway for now this is me. 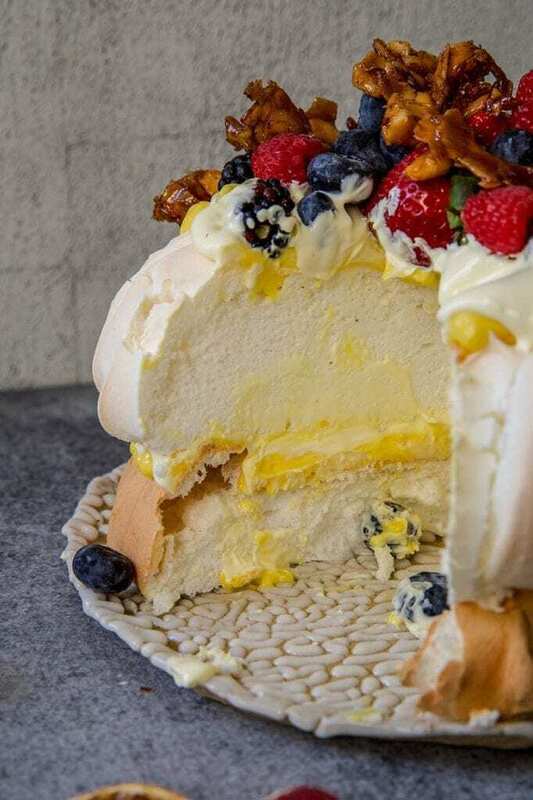 Enjoy your keto pavlova now, or at Christmas. I am sure it wont be made just once. Oh yeah! Then there is this version of the pavlova in the Christmas Advent line up. 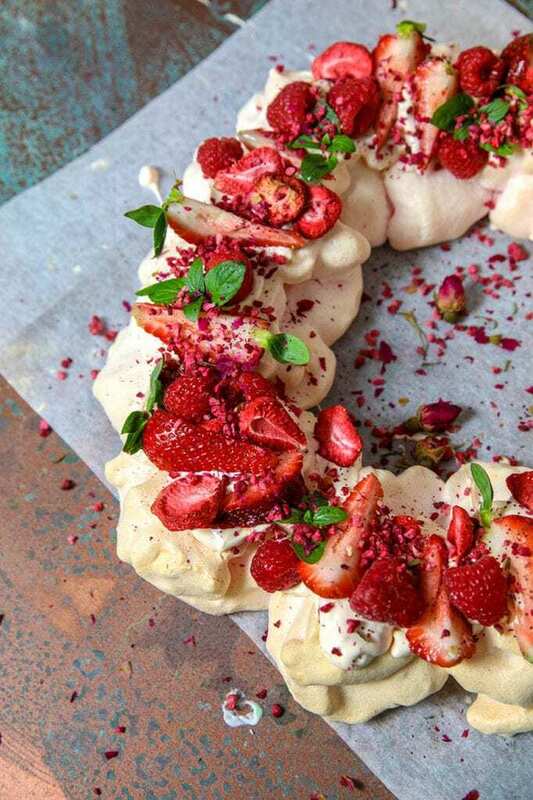 How delicious and a little twist on the pavlova mix too! 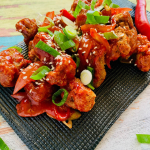 Please help me by sharing this recipe. 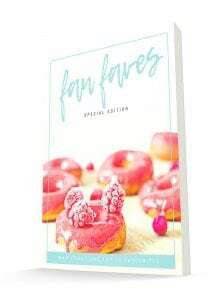 It is your shares, comments, pins, and yums, that help and inspire me to release free content. Please remember that screenshots of the recipe in a share is a violation of copyright. Please use link shares only. 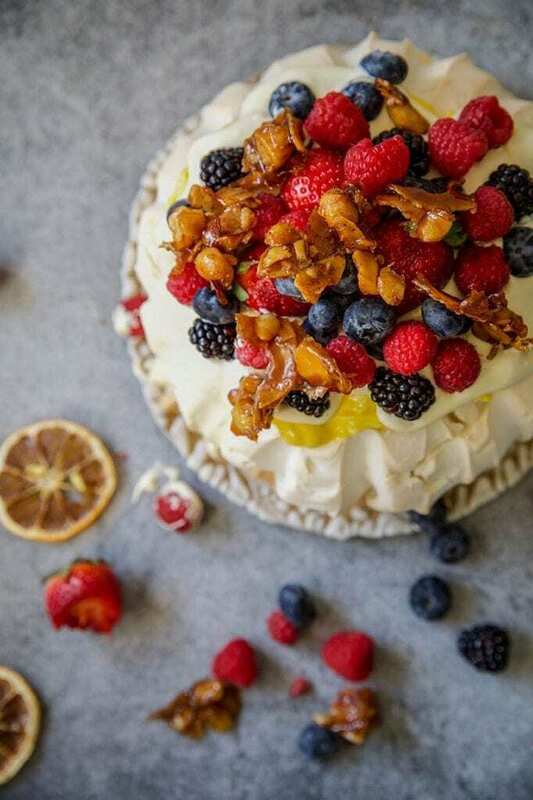 For many Australians there would not be Christmas without a pavlova. 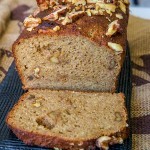 For keto followers we needed a great sugar free one and here it is! Preheat oven to 150℃. Line a large baking tray with baking paper. Clean bowl thoroughly with vinegar and paper towel. Dry well. Insert butterfly. Add egg whites and cream of tartar and mix 5 minutes/37℃/speed 4/MC off. Set Thermomix® to 5 minutes/37℃/speed 3 and add erythritol 1 teaspoon at a time every 10 seconds. Add in xanthan, vanilla and vinegar for rest of mixing time. Turn oven down to 100℃. Spoon meringue mix into large high pavlova approximately 25cm in diameter. Smooth sides and top to desired pattern. Cook pavlova for 90 minutes. Turn off oven and leave pavlova to cool in oven for 3 hours or overnight. Keep oven door closed. Clean mixer bowl thoroughly with vinegar and paper towel. Dry well. Use an electric mixer to whisk egg whites and cream of tartar until soft peaks form. Add add sweetener 1 teaspoon at a time mixing well after each addition Add in xanthan, vanilla and vinegar and mix well. 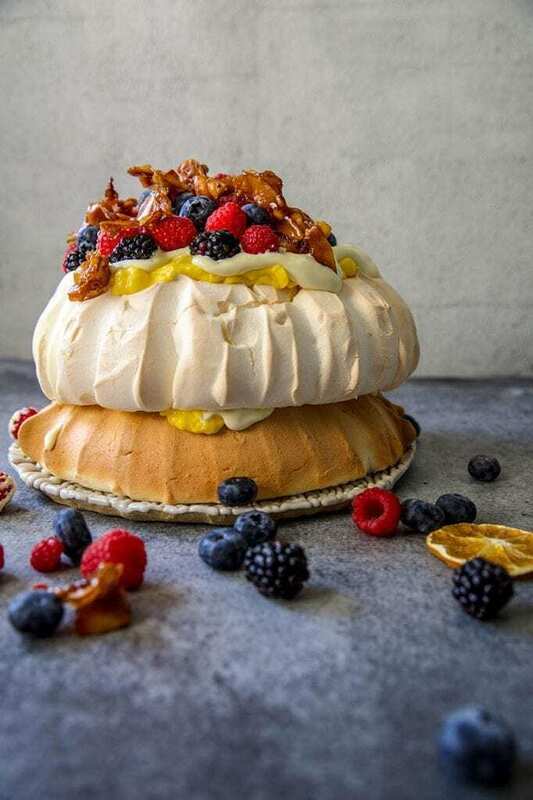 Nutritional is based on an unfilled pavlova. To calculate the total for a decorated pavlova simply add your topping ingredients nutritional and divide by 12. A low carb and calorie count was achieved through using a powdered sugar alcohol that is zero carb and zero calorie. Serve with your favourite low carb toppings. This pavlova is not overly sweet. To re-crisp a pavlova if it goes soft: Preheat oven to 200℃. 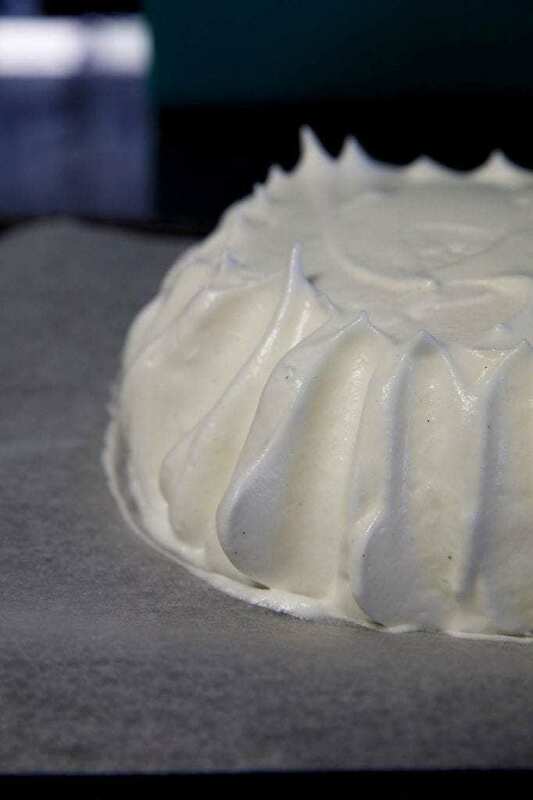 When heat is achieved turn it down to 150℃ and add pavlova for 4-5 minutes to re-crisp. I strongly recommend following this recipe and its cleaning and sanitising methods as per the instructions. Testing has proved that other sweeteners have unreliable affects. Erythritol is preferred for its recrystallisation after heating. Powdered erythritol or Sukrin Melis result in a crispy exterior and marshmallow centre. Thank you Megan. If I don’t have the Sukrin Melis and at the moment cannot afford it what would I use please? 3-hour wait! I want to devour this straight from the photo! It looks so good festive. I will try using Stevia. Do I need a silicone mat or just a normal tray? Do you have a recipe for the lemon curd minus the sugar. 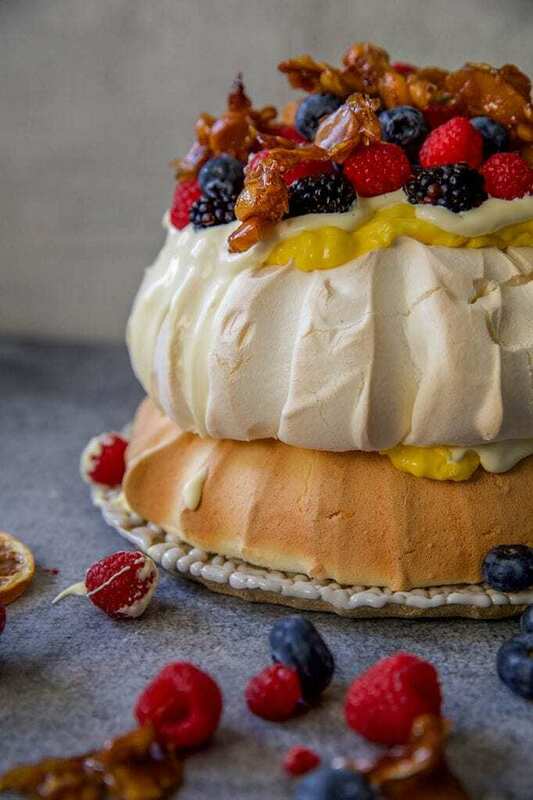 This pavlova looks smashing! HI Deidre, if you click the link the curd actually has no sweetener at all and is delicious! This is an awesome recipe, Megan. I tried making a half recipe and it cooked beautifully in just over an hour. So light and not overly sweet. I will be serving this on Xmas day happily knowing that the children will not be getting a massive sugar hit. You are a genius. Thanks so much Debbie. It is nice to know it is no sugar and still tasty that everyone wont even know. Really looking forward to making this, looks divine! Just wondering if there is a carb count, it’s missing from the Nutrition table. I made this yesterday, along with the lemon butter. Both turned out really well. WInning recipes indeed! Well last night was the first time I have ever made a Pavolva. I didn’t realise it was that easy to make!! This recipe is divine- I made it for my Son-In-Laws 30th Birthday family dinner. Should have made two – He has ordered another for this weekend!! It was so light & fluffy & of course decadent to boot. If you haven’t made this I really recommend that you do. You will be pleasantly surprised!! As with all your recipes this one is a true hit with the family! Thanks Tania. i think this recipe is a pretty special one for sure. When it comes make 2 lol. You end up with lots more friends when one of these is made. 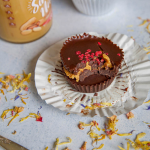 Oh my goodness- YUM… Thank you Megan.. You are amazing..
Can real sugar be used & the amount I am gluten free & artificial sugar do not agree with me. If I don’t have powdered eyrithritol can I “powder” regular eyrithritol in a food processor? Thankyou Megan I made this Pav today and love it, my partner is super impressed too. This recipe is a keeper, thx again. Thankyou Megan this Pavlova is fantastic. My partner absolutely loved it too! Mine didn’t turn out crunchy outside! Was the oven meant to be on ‘bake’ setting, or fanforced? It was definitely very light though. Absoloutly amazingly. I love what Sukrin products have brought to the keto kitchens they are amazing with zero carbs. This Pav us so light and fluffy and delightful thanks Megan. I used a lime curd as I had a heap if them and was devine. Thanks Deborah. Yes Sukrin products are totally fabulous. Glad you enjoyed the pav, and I too will have to try one with a lime curd as well. I thought pavlova was one of those things I’d never eat again. This was delicious and super easy to make. It was actually the first pav I’ve ever made. I’ll be pulling this out Xmas day. Made this today. Yumm. But is there a trick to getting it off the paper whole. Mine collapsed at this stage. Still tasted great though. I place my hand over the top and turn upside down and gently peel it off. Does anyone know how many days ahead you could make this please? Does anyone know whether this can be made 2 or 3 days before required please? Can all forms of sugar or sweeteners be removed from the recipe? So simple and easy, beautifully thick mixture which made it easy to pipe. Turned out perfect, 1st attempt! Love love love….. thank you my very first try… and this is and will be my go to pav recipe from now on. I bought some Suriname Melis and I’m a bit confused as to how you can say that this recipe is low carb or Keto. It indeed doesn’t have any calories but the packet states there are 6g of carbs in every serving of 6g so with the recipe calling for 80g of this then it’s also 80g of carbs. I also double checked the Sukrin.com website and it is the same information. Am I missing something? I made this for an Australia Day BBQ, toppd it with vanilla whippped cream and fresh berries and it was a huge hit with everyone. Will definitely be keeping this recipe on hand for future! Megan I had a fail. It started off lovely and glossy and mix tasted amazing. Cooked it exactly per instructions and left in oven over night. In morning checked it and not crispy. So tried the reheat method and browned up lovely. I let it sit in oven but was getting browner so took it out and as cooled softened up and shrunk. 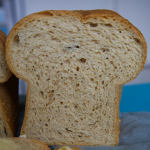 I substituted xylitol powder and vanilla bean paste – could that be issue? Also had fan on in oven. Hi Evie, yes xylitol is very unreliable in this recipe. It tends to give a soft chewy texture. 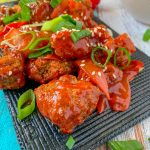 I have left notes in the blog post and notes recommending powdered erythritol or Melis for this recipe only as it gives a perfect crisp shell and soft centre.